Just Jingle: Oh, How I LOVE a good PUNCH! Not in the face, you silly crazy people! A PAPER PUNCH!!! I love them. I have Sally the Cricut, and I love her dearly, but somehow she never has been able to replace punches for me... much to the Hubbums' chagrin! HA! I just love punches! They are super fun and you can do wonderful happy things with them! SO...when Cath issued The Punches Challenge in the Moxie Fab World, I jumped on that like...something one might jump right on! Yup. That's what I did. I pulled out this beautiful Martha Stewart punch that my Mommy and Daddy gave me for Christmas! I absolutely love it! I wanted to let it sort of star in the show, so I made it a dominant feature on the card. 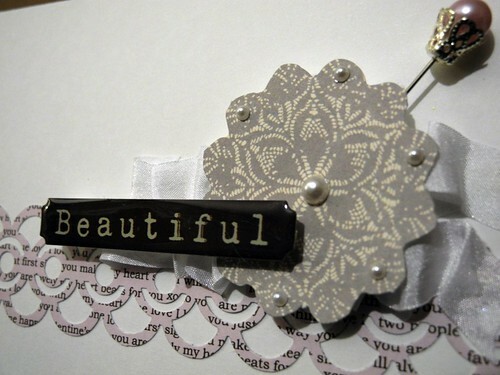 I created a cluster of embellishments to ground the sentiment using various layers of foam tape. The patterned paper and the die cut are Fancy Pants and the sentiment is from Glitz. ALL of that goodness came from the January Scrapbook Circle Kit, You + Me! This is a seriously fabulous kit! The ribbon is, of course, May Arts! On another note. It's snowing. Hrmph! That's all I have to say about that. And the funny thing is...The Hubbums had ski club with his students (he is one of the sponsors) YESTERDAY when it was in the mid 40's and there hadn't been a flake of snow to speak of! HA! Ooopsies! Oh, well. At least it was only the first week, so maybe they will get more snow later...although...I have to be honest...I may be praying in a manner that will not be helpful to the ski club. Just say'n. HA! OH...and in case you missed it, I DID update yesterday's post with my desk shot to PROVE that I had it tidied up! Just say'n. Gorgeous! Love the white background - the border just pops right off! Love the simplicity of the design too! :) It is supposed to snow here today too and I just dread it. I commute an hour (in GOOD weather) and I have no choice but to go. I have no idea what will happen if the roads get bad. Hope it all melts immediately! 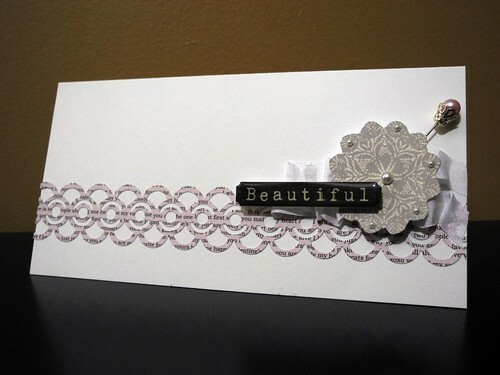 Beautiful and elegant card. It snowed here too last night, more expected today. Uck. We haven't had much snow to speak of - tonight it's on the way, but changing to ice pellets & then rain? In January? In Nova Scotia? Just wrong. If those are my choices I'll pick snow! Love that punch - and the beautiful trinket pin! I might be sharing your prayers!! No snow for us here in southwest Louisiana, but a freeze warning for us for about 8 hours overnight tonight. Love, love your punch and your card is simply divine...I have to say I thought I'd be ending my love affair with the punch when I bought my Silhouette and for awhile that was true but then...all sorts of lovely punches and dies came out and well, you can never have too many of them...imho! I like the newsprint lace...gorgeous. Well, like your sentiment says, it is beautiful! WHAT???? How DID I miss that M.S. punch??? I SERIOUSLY should own STOCK in her punches! I just wish I could get ahold of one of her DEER punches! I've tried to find one for THREE YEARS! JUST bought the one with multi-sized stars! It can be punched from ANYPLACE on the page! Cool, right? Anyway, I love the one you used! And your new card is gorgeous! Your DESK is pretty awesome, too! And YOU? Well, of COURSE you are WAY awesome! Have a beautiful day! This is beautiful JIngle. Did you make the hat pin? It is beautiful also. I have been pondering if that MS punch needs to come home with me. Really beautiful card...love your color choices. Very elegant. So elegant. Love the pin. Oh how I love a good headline! 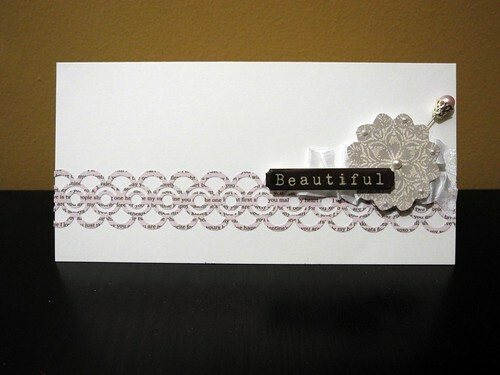 Beautiful is the perfect word to describe your card! Lovely -- especially the pretty pin! beautiful card, yup, I am a punch girl too, barely a creation goes by without some item punched on it! hope you don't get much snow, we have hardly had any this winter, very unusual for here, kids and hubby not impressed, they haven't done much ski-ing yet! Loving all the depth on this one, Jingle... between the border punch and the flower punch and the way you've popped it all up... great stuff! Awesome...as always!!! I so love this one because it really is Beautiful!! I like the hat pin too....adds that "something something" to it. No snow for us this year in Edinburgh, Scotland...we needed a break this year! Love that punch - am now off to find it in the UK! beautiful~love the colors and design!!! I am with you, I love my punches!!! Especially border punches, nice card. that is a great paper punch...Awesome card...I love it..
Fabulous card! Love your sentiment! very pretty, nice and simple. Love that punch! My Silhouette Cameo hasn't replaced my punches either! I can't get enough. The card is fabulous! Love the punched paper choice too! Looks fabby! Beautiful card Jingle, that's rockin punch! Very pretty card! Love everything and the hat pin!